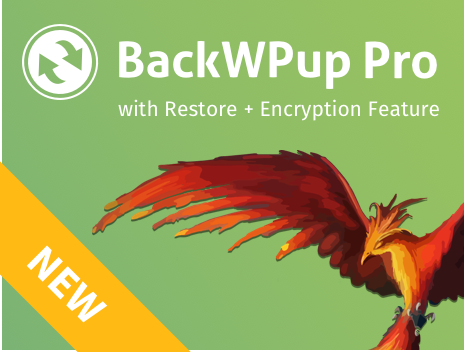 BackWPup not only allows you to automatically back up your WordPress website, but also to make detailed decisions about exactly what you want to back up. The simplest way – which we recommend to BackWPup novices – is to set up a WordPress Full Backup , i.e. of the entire database and all files. It means that if something goes wrong, you still have everything in your backup and don’t have to reinstall anything manually – as would be the case if you exclude your plugins to save disk space. Once you have installed BackWPup, create a new job by going to BackWPup Pro → Add New job via the backend. Create a name for your backup job in the tab “General”. Database Backup – backs up the database of your WordPress installation. That is where information specific to your installation is stored: users, posts and pages, products, orders etc. A backup of this database is vital, as this information cannot be found anywhere else. File Backup – backs up the files of your WordPress installation. These include WordPress files, themes and plugins, as well as your uploaded images. WordPress XML export – exports some information from your database to an XML file, which can then be loaded into another installation via Tools → Import Files. It allows you, for example, to transfer your blog entries and pages to another blog. For beginners, using an XML file is a lot easier than going via the database. Installed plugins list – this is simply a list of the plugins installed in the blog; if things go wrong, it shows you which plugins you will have to reinstall manually. You won’t need the list if you do a complete backup of the database and files. Check database tables – the system checks for corrupt data during the backup process and repairs them, depending on your settings in the tab Database Check. Select the backup destination in the section Job Destination. More information about backup destinations can be found in the category Backup Destinations.All other settings in the tab General can be left as they are.The settings you have configured now should be sufficient for creating a full backup. Each of the tabs contains more detailed settings and if you aren’t ready to back up all files as yet, you can exclude specific directories or files in the tab Files. To start your backup job, please follow our guide Starting a backup job – immediately or scheduled.